A self-guided tour of the Museum can be an exciting and educational experience. The foundation of the tour is laid when you read the inscription on the large granite panel near the reception desk, and then look up at the 100-foot mural. The mural is an accurate painting of the surrounding mountains, reproduced from timed, still photographs. • The tour begins with a stop at the natural history exhibit, a visit to the Native American and Saura Indian wigwam and then on to an exhibit about the world's largest open-face granite quarry. • Travel through time along the mighty Yadkin River and learn about life in a log cabin, the region's early settlers and communities, and early commerce. • Next, visit a turn-of-the-century general store, a train depot and a 70-foot scale model railroad that takes you from Sanford, North Carolina to Kibler Valley in Virginia. • The lower level of the Museum is home to three American La France fire engines - dated 1917, 1926, and 1946. The recreated living quarters of the firefighters are also on exhibit. • Turn-of-the-century household items in a Victorian parlor, clothing, and toys are part of exhibits located on the second floor of the Museum. Also featured are exhibits on the Siamese twins, Eng and Chang Bunker, Andy Griffith and his heritage, award winning country music singer and song writer Donna Fargo, the famous musician Tommy Jarrell and WPAQ radion station founded by Ralph Epperson. The War Memorial Exhibit is continually expanding. • Exhibits on our third floor include the regional medical story, Model T Fords, tobacco barn, textile, moonshine and winemaking plus a look at the inside of the Merritt Hardware store's office. • Children and adults alike will enjoy the "Hands On History" Childrens Gallery also on the third floor. 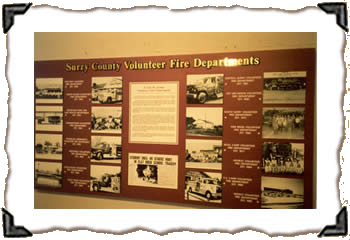 • Throughout each year, temporary or traveling exhibits will be on display. • A visit to the observation room, located in the clock tower, provides a memorable view of the mountains. Come and enjoy! All visitors are asked to register at the reception desk in the Main Gallery. The Museum has a no-smoking policy throughout the entire facility, which includes the Woltz Clock Tower. No video cameras or flash cameras may be used in the Museum. Requests to use still cameras should be made at the reception desk at the time of registering. Food and drink are not to be consumed in exhibit areas. All cell phones must be turned off prior to entering the exhibit areas. Official Service Animals are the only pets permitted in the Museum. If the Mount Airy City Schools are closed due to inclement weather, then the Mount Airy Museum of Regional History will also be closed to the public. Please call ahead for any change in Saturday Hours. Please use the Google Map below and select "Directions To" or "Directions From" for driving directions to and from the museum.